This is me playing pumpkin patch bunn. Next we'll see how you like me as were-bunn. PS: Follow BenjiRoo on FB! Oh, someone is done for. I mean, try to avoid the upcoming days' newscasts. I have noticed they sometimes fail to say, "Be advised. The following report contains some disturbing content." Reminds of an old joke. All three newspapers are reporting on rabbit rampaging. The Washington Post headline is "White House Insiders Knew First." The New York Times headline reads "Third World Hurt the Most." USA Today says, "We are dead. Final, final Sports on page 2". I hope RG gets the latest word on his whatchamacallthems. I'm keeping my head under the pillow until BenjiRoo finds other things to do. Besides - those whatchamacallthems were highly over rated. 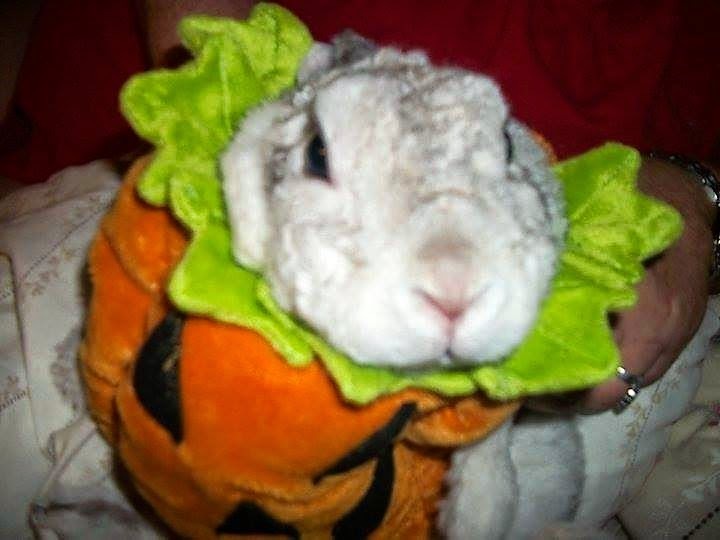 Oh no--here we go again with the season of putting costumes on buns! I think it is just long enough from year to year that people forget. Perhaps edible costumes is the wave of the future in Bunn fashion? I mean, this get-up would not be half as fearsome if it were made of real pumpkin...messier, perhaps, but if it could be eaten away, it might at least have more pacifying effects on BenjiRoo...Well, in the meantime, I'll make a dive for the bunker where everyone else is hiding.